The characters from the TV show Gunsmoke depicted an image of chivalry on the frontier, and the cowboy as an American “knight in shining armor” for an entire generation of viewers. What do honor and chivalry have to do with drama? Simply put, acting with honor is easy when things are good; it’s what happens to the code of honor when things go bad that makes a story interesting. For the knights of King Arthur’s Round Table, there was no challenge in being chivalrous in the luxurious halls of Camelot; what marked them as “great” knights was whether they could maintain their honor when tested in the real world as they set forth on various quests. Having honor in a perfect world is not very difficult — and it doesn’t make very interesting stories. This is why the ideal of chivalry transfers so well to the stories and characters of the Old West. 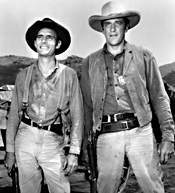 Living in a protected, established society like the antebellum South or the Eastern seaboard, characters like Matt Dillon (played by James Arness, pictured with Dennis Weaver on Gunsmoke), Ben Cartwright or Seth Adams would have had no trouble sticking to the principles of chivalry. What creates interest is what these honorable characters do when confronted with lawlessness, savagery and corruption. And needless to say, not all western heroes proved entirely chivalrous — William Munny, Wyatt Earp, Paladin are reminders that if westerns are marked by the clash of honorable values and an untamed environment, they are equally marked by heroes who fight an inner battle against their own dark, brutal natures. The character of the flawless, white-hatted cowboy rode into the sunset with the 1940s kiddy westerns of Gene Autry and Roy Rogers. And if chivalry in a vacuum is a mark of the western, it is just as much (if not more) of a mark of science fiction. Can honor, morality and chivalry stand up to the challenges faced by human beings as they move into the frontiers of the future? This is the premise that creates tension and drama in nearly all science fiction stories. The claim that chivalry has no place in sci-fi (as Wright states) ignores two of the most influential entries in the science fiction genre in the past 50 years: Star Trek and Star Wars. Captain Kirk and the adventurers of Star Trek carried out a mission not unlike quests pursued by King Arthur’s knights: To help those in need without allowing their superior strength to harm or overwhelm. Consider Star Trek (the original television series, that is): A cadre of adventurers (pictured at left) on an extended quest through unknown, often savage territory. It’s a premise that could have come right out of the stories of King Arthur. 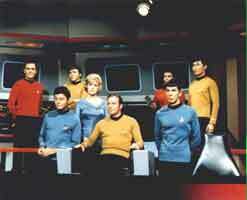 (In fact, more than a few parallels can be drawn between the crew of the Enterprise and the Knights of the Round Table.) Yet without chivalry, Kirk, Spock, Scotty and all the rest would be indistinguishable from the villains they encounter. But they have a 23rd century version of the code of chivalry called the Prime Directive that obliges them to protect and respect what they could otherwise simply dominate or assimilate. 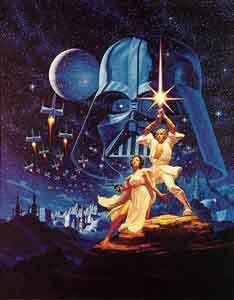 Star Wars is, at its heart, a tale of chivalry and the quests of the “Jedi” order of space knights. Similarly, the world of Star Wars would be radically diminished without the principle of chivalry — after all, many of its main characters are knights. Obi Wan explains, “For over a thousand generations the Jedi knights were the guardians of peace and justice.” His words inspire Luke to take on the challenge of rescuing a princess — a quest that any of the Knights of the Round Table would certainly have jumped at. Without chivalry, Luke would have rejected the risks of the hero’s journey and simply spent the movie racing T-16s with his adolescent pals through Beggar’s Canyon on Tatooine. Science fiction is about possibilities. If the code of chivalry seems a bit different when represented in a science fiction milieu, it’s because audiences are being challenged to see the old code of honor in the light of new possibilities. The protected becomes the protector, technology demolishes social order, science threatens spirituality, the needs of the many outweigh the needs of the few … How do such philosophical, theological and technical suppositions affect the understanding of what it means to be just, honorable and moral? The code of chivalry is still present in the utopian and apocalyptic worlds of science fiction for those who can stretch their imaginations enough to see it.